I love how my Down Syndrome mini turned out! A blue and yellow ribbon symbolizes Down Syndrome awareness, and for the rest of the painting, creativity took over so I just let it flow. I chose not to add words; I think the painting itself does the talking. I have never worked with or known an adult with this disability, but from the experiences I've had with children, they are mostly happy, and show their happiness with big beautiful smiles and sparkling eyes. 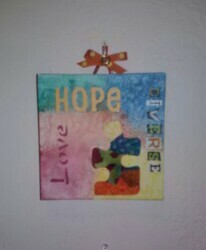 I thought it was such an awesome idea that I painted another for my shop, as well as one for Down Syndrome. I can't wait to get the finishing touches on them so I can upload them to my etsy store! My current works in progress, all waiting for finishing touches. 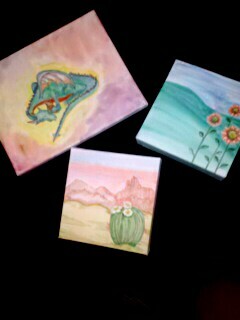 My newest mini watercolor on canvas. This little 4x4 is a simple watercolor with a dash of encouragement and a bit of bling. 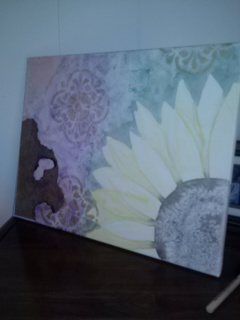 The lace was an after thought as I realized the canvas was slightly dented. I didn't like the looks of that at all, so it was sequinned lace to the rescue! I've been wanting to use this lace because its such a pretty blue and the sequins add sparkle. Tonight was the perfect opportunity. I think the color and bling give the painting just the right touch of whimsical pizzazz. This piece will be for sale in my upcoming etsy shop... opening soon! I decided to do something different from the mixed media, sticking to strictly watercolor, with cats. I decided to make it a Mini (4x4 canvas). I love my two fur babies and chose to model my cats after Tigger (orange tabby) and Mina (black... in this case indigo). I did keep to my LOVE theme though, so I incorporated hearts into my painting... 3 of them to be precise: (1) the sun (2) the upright tails (3) and the shadow of the tails in the grass. 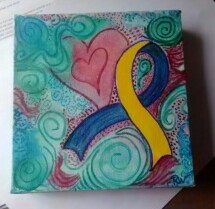 I had fun with this tiny project, and my mood shows in the vibrant colors, resulting in a cute whimsical piece. I am really enjoying this creative burst that I'm in, in fact it has sparked a possible new venture in my life... selling my work, but until I can get started on that, I have to build up an inventory to post. However, I have begun a piece for a friend who has requested a dragonfly. This canvas will be different than my last, as I am building on techniques and ideas, so I'm curious how it will turn out. The inventory building will begin after this current piece. I am not going to make a practice of taking requests; I think that would be too much for me time wise as well as stressing about meeting the customer's expectations LOL, so I will stick to creating on a whim and posting the finished products for sale (on etsy) at least that's the tentative plan. I'm excited about the prospect, yet fearful. I've never attempted to sell my paintings, or have any sort of online store like etsy or ebay, so yeah, there is alot of stuff going on in my head right now BUT it seems to be helping me through this depression, but NOT the insomnia LOL I can't get my thoughts to turn off, and I can't seem to put a work in progress aside. I absolutely have to finish it once one has began. I'm going to have to discipline myself and set a strict time limit each night. I can already hear a little voice in my head arguing with me like a child: "But...but... I HAVE to finish it first! I don't want to go to bed!" I can just visualize my child self stomping her foot and having a tantrum. Speaking of bedtime... I best get to it! It's already late (sigh). 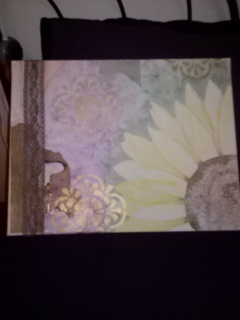 It's not too bad for my very first attempt at a mixed media piece, and my first time painting a sunflower and dragonfly. I had a bit of difficulty with my signature, darn it, so it's a bit sloppy. Hopefully with practice I'll improve, but what really matters is... I had fun doing it. 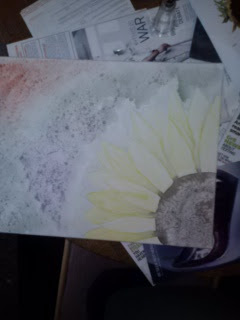 I've never done a mixed media piece before, nor have I ever attempted to paint a sunflower. I began with freehanding an outline of the sunflower in pencil, then started painting it with watercolors, adding a bit of background as I went. I used salt in the wet paint to get that texture for the flower. After it dried, I added more watercolor, drying in between, and then I added some decorative paper with mode podge, some stencils, stamps, lace, etc. I've been researching mixed media ideas, trying to figure out what I want my painting to consist of, etc and and I've found a few cool pieces for examples, as well as learning about all the different mediums, tools, and everyday household items that I can use for textures, etc. My mind is just spinning with ideas right now! I love the use of cardboard in this one; what a clever idea! Different textures, using a variety of miscellaneous items from sponges, to bubble wrap. All this makes me want to hit the thrift stores, craft isles, and sewing isles in search of goodies to use and supplies to buy! Oh, Nightly Slumber, Why Has Thou Forsaken me? Come back, come back, my sweet sleep! Let us be together again in peaceful restfulness, I beg of you! I've been having issues with insomnia...really bad issues. I've had insomnia before, but never to this extreme. I'm either I'm pulling an all night-er, not sleeping at all through the night, which is happening more and more frequently), or I have trouble falling asleep and only get 3-4 hours of sleep in, or I get to sleep at a reasonable hour only to wake up at 3 a.m. unable to go back to sleep. It's frustrating and its exhausting! Interestingly, I've been in the mood to create. I say interestingly, because it so rarely happens anymore. I want to do a multimedia piece. I'm still thinking of ideas, but I lack motivation during the day. My off-the-wall sleeping habits (or lack of) are really messing with me big time! I feel yecky... fatigued, weak, lightheaded, just all around not good. All I want to do is sleep... as much as I can anyways, which lately seems to be on my days off, all day. So some days I am running on sleep deprivation and on my days off I am sleeping my life away. Somehow, someway, I've got to fix this.